Hjolfrodi the Harrier is a Nord warrior who can be found worshipping at Namira's Shrine. 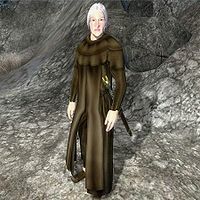 If your personality is higher than 20, she will tell you that you are too attractive to speak with her matron Daedra and order you away. She wears a monk's robe with a pair of clogs. In combat she will rely on one of two weapons; a leveled shortsword or iron dagger. She also carries a small sum of gold. When you arrive at the Shrine, the two other unattractive worshippers, Blanche Mastien and Degil, will both point you to Hjolfrodi for further information: "Don't talk to me. Talk to the one in the robes" and "Talk to Hjolfrodi. I can't help you." When you speak to Hjolfrodi she immediately asks, "Who are you? Why do you invade our place of worship? Surely, you don't think yourself worthy to visit Namira's shrine." Asking about Namira makes her almost happy: "A place of blessed darkness. A holy place where we may worship in our wretchedness. Why are you here?" If you reply, "I am just passing through", she will snap, "Then leave this place. Namira has no business with you." If you instead say, "I wish to worship Namira", two outcomes are possible. If you have a high personality she will dismiss you with, "You do? You are too pretty to worship in this place. People like you. Like to hear you talk. When you are more loathesome [sic], you may return." However, if you have a low personality she will be slightly puzzled and say, "You do? Perhaps you should. You are repulsive, displeasing to the eye. Namira might find favor in you. Approach." If you bother her again while still having a personality over 20 she will become angry and say, "Why are you here? You are still too pleasing to speak with Namira. Begone." Once you manage to get your personality low enough after being rejected the first time she will be pleased and say, "Ahh... much better. You repulse me now, at least to a degree. Others should find you foul, disgusting. Namira may be pleased. Approach the shrine." You will now pass Namira's inspection and are allowed to continue the quest. Once you have spoken to Namira, asking Hjolfrodi about Anga will have her reply, "Hallowed ground, home of the Forgotten Ones. A deep hole of shadow and despair. A truly wondrous place." Hjolfrodi the Harrier will never break her vigil of the shrine for anything, spending all of her time worshipping at the shrine. Hjolfrodi was supposed to add a bit of information about the Forgotten Ones in Anga, but the dialogue can not be heard in-game: "Blessed are the Forgotten Ones, Chosen of Namira. In squalor they thrive, wallowing in filth, low and repulsive, darlings of Namira." This page was last modified on 4 January 2019, at 03:49.